The Variable Area Flow Meter DS10 operates according to the proven variable area principle. The flowing media moves a float upwards against gravity in a conical measuring tube.The height of the float indicates the flow rate and maybe read off a burnt-in scale on the measuring tube. Optional inductive contacts, which are mounted on the measuring tube, may be used for flow rate limit detection. 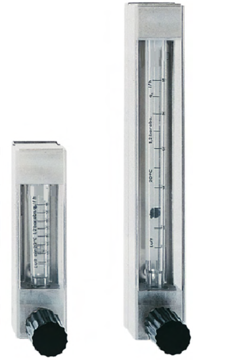 All meters are equipped with an integrated needle valve for exactly regulating the flow rate.minimum compared to regular variable area flow meters.